Metal Injection Molding, also called MIM, is a low cost, high volume manufacturing process that produces custom metal parts near to net shape. It combines the way injection molded plastics are formed with powdered metal sintering to create metal or ceramic parts which are stronger, denser and more capable of complex geometric shapes than most forged or die cast metal parts. Metal Injection Molding, also called MIM, is a low cost, high volume manufacturing process that produces custom metal parts near to net shape. The process creates metal or ceramic parts which are stronger, denser and more capable of complex geometric shapes than most forged or die cast metal parts. A relatively new invention in manufacturing, metal injection molding combines the flexibility of the injection molding process with the strong structural integrity of sintered powdered metal. The strength, economy and capacity for complex shapes demonstrated in injection molded metal and ceramic parts are sought-after attributes and are becoming more widely utilized by telecommunications, automotive, medical and dental instrumentation, industrial parts, orthodontics, firearms, hardware and lock components, computer and electrical application industries, among many others. Injection molded metal parts are formed from sintered powdered metal, as are regular powdered metal parts. The powdered metal or ceramic powder used in the injection molding process must, however, become plasticized in order to flow through the injection molding machine. Polymers called binders or wax are added to the powdered metal base, creating what manufacturers call “feedstock”. The feedstock pellets are fed through a hopper into a screw conveyor where they are sheared and friction heated until the material becomes malleable, then it is extruded into a closed die at the screw conveyor’s opposite end. The tools used here range from simple designs to multi-cavity molds. The molded part is allowed to cool until it has solidified, then it is ejected and the mold is filled again. These molded but not yet sintered parts are called green parts. The polymers of these parts must be extracted through a process called debinding. 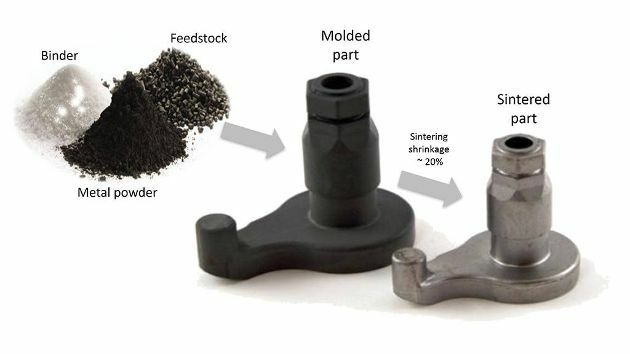 Debinding can be done chemically (as through a solvent bath) or thermally, and sometimes the sintering process is even sufficient to break down green parts’ polymers, dissipating them during the sintering process. Green parts are sintered between 2200 and 2550 degrees Fahrenheit and shrink in the process as the pores where polymers were close, creating densities between 95 and 98%, almost as high as that of wrought metals. This is done in a high temperature sintering oven. Despite the shrinking, closer and more accurate tolerances can be achieved with injection molded metals than with die-casting or forging. Metal powder parts which must be cast or forged in multiple pieces can often be molded and sintered as a single part, cutting down on expensive secondary assembly processes such as drilling, etching or assembling.. Other post-processing operations like machining, heat treating or plating take place at this time to enhance properties and reach higher tolerances. Resin impregnation is an example of a process used to enhance the lifespan of porous metal products. Ferrous-based alloys are most commonly used in metal injection molding, as well as low alloys, stainless steels, copper, chrome, nickel alloys, semimetals, intermetallic compounds and magnetic ceramics. The densities injection molded metals achieve not only give parts much higher strength, but also higher corrosion resistance and, for magnetic compounds, improved magnetic qualities. Although some short runs may still be more economical than die-casting or forging, injection molded metals are usually manufactured in long runs to balance high overhead mold tooling costs.